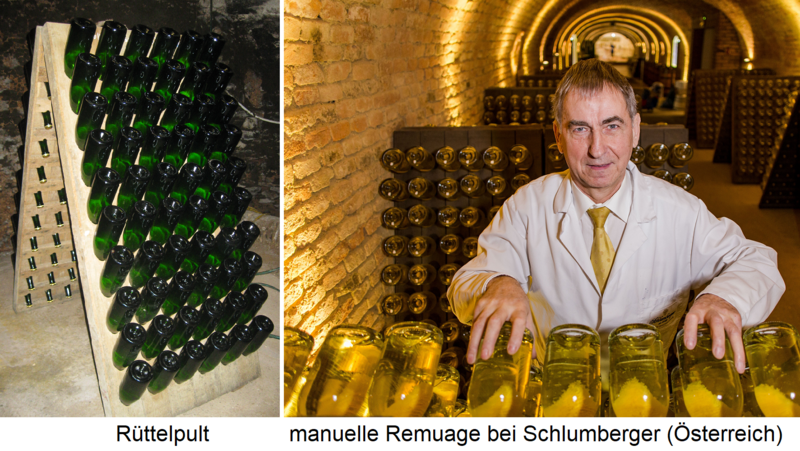 French term (German shaking) for a in the production of sparkling wine common process in preparation for the following dégorgement (Removal of the yeast batch). The process was by Antoine de Müller, the legendary cellar master of the company Veuve Clicquot-Ponsardin, invented around the year 1815. Already at the Dosage (Addition of the "liqueur de tirage") for triggering the second fermentation in the bottle are increasingly being added by many producers so-called Rüttelhilfen, whereby the precipitation of the yeast deposit is easily accomplished. In most cases this is a mixture of bentonite and tannin, which prevents sticking of the thereby granular depot on the bottle glass and causes a uniform sliding along the bottle inner wall. The bottles are placed with the neck in the at first very steeply roof-shaped shakers (vibrating tables, French Pupitres) (boards with round holes were used since ages for draining rinsed wine bottles in use). At the beginning, the vibrators have a nearly horizontal position and are then steeper and steeper (see picture). As a rule, a Pupitre holds around 60 bottles of sparkling wine. As a positioning aid for the Remueur (shaking master) is on bottle bottom a white chalk mark or any other color code marked as the starting position. This one is also called Winery point (marque). To release the yeast from the wall, the bottles are manually shaken daily by the janitor for up to three months, rotated one-eighth (45 °) or quarter-circle (90 °), and the shaker rack set a little flatter until the bottles are upside down stand (sur pointe). Usually this is done 24 to 32 times. During the process, the yeast slowly spirals into the neck of the bottle until it sits behind the cork at the end. This elaborate process is required to avoid settling the yeast in the shoulder of the bottle. Undesirable deposits that do not slide down when jogging are referred to as "masks". Experienced joggers can handle 30,000 to 50,000 bottles per day. This page was last modified at 14 April 2019 at 09:39.